By using the ReaderLinks plugin on a WordPress site where your Facebook Pixel is already configured to run. By using ReaderLinks links after placing your Facebook Pixel ID in the Pen Name Settings area of ReaderLinks. After you have set up your Facebook Pixel and have it running effectively with ReaderLinks, give it a few days to start accumulating data. This will require you to share links, do ads, send tweets, etc. using your ReaderLinks links, of course. 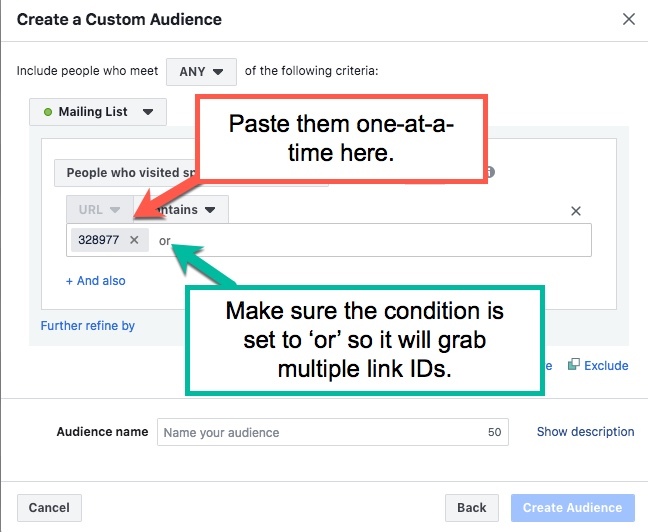 Once data is showing up on your Facebook Pixel page, you can create a custom audience using that data. 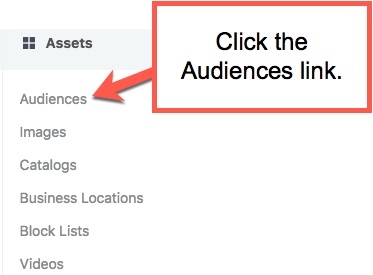 Step 1: Go into the Facebook Ads Manager, into the All Tools section, and click the Audiences link under the Assets column. 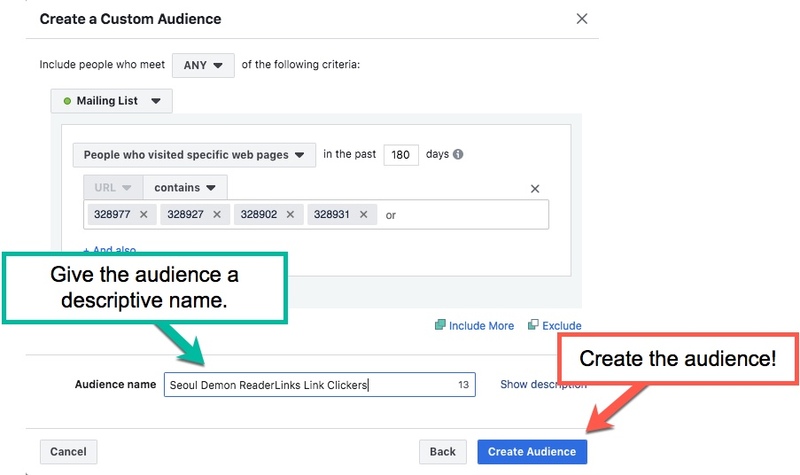 Step 2: Click the dropdown for Create Audience and select the Custom Audience option. 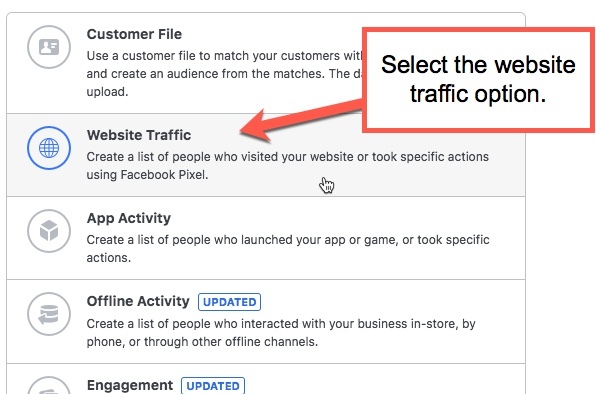 Step 3: Select the Website Traffic option. 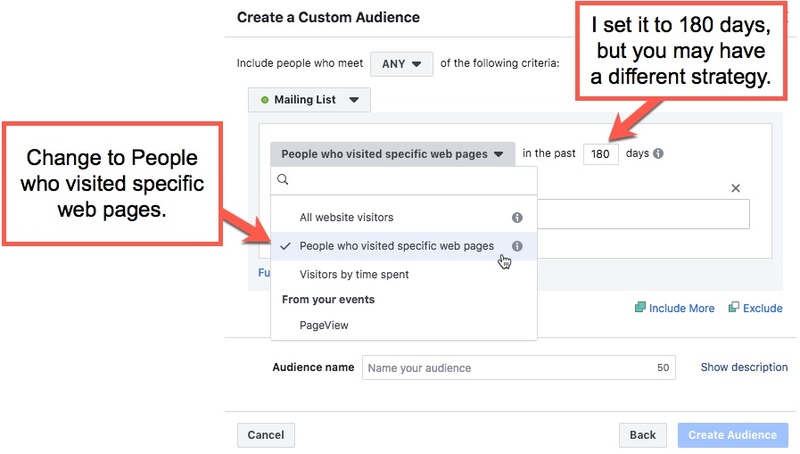 Step 4: Set the number of days in the past you want to collect data for and change the All Website Visitors dropdown to People Who Visited Specific Web Pages. 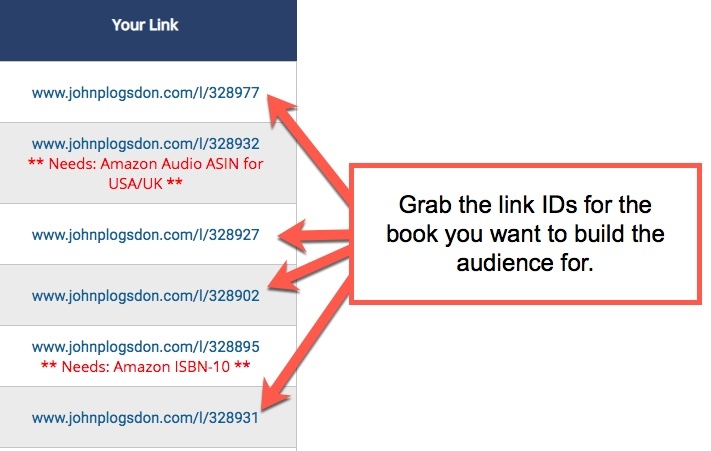 Step 5: Jump to the ReaderLinks book page that you want to build this audience for. Then, click on the Book Links tab and identify the links you want to track. You’ll need to copy the ID numbers for each of these links. Step 6: Paste the IDs one at a time (pressing the spacebar after each) and make sure that you have the condition set to ‘or’ here. Setting it to ‘or’ will allow Facebook to build the audience off multiple IDs. Step 7: Give the Audience a name that’s easily identifiable for you. I personally put the book name and note that it’s related to my ReaderLinks links. 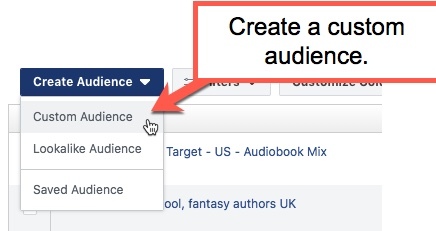 Once your done, click the Create Audience field and wait for Facebook to build the audience for you. This can take quite a while, but Facebook will notify you when it’s all set! Note: If you haven’t accumulated enough clicks for your audience, you will likely get an error from Facebook saying that the audience is too small. This just means you either need to increase the number of clicks, wait a little while longer, or both.